Now that Microsoft owns it, Is Skype somehow scanning your computer for viruses, and calling users to give advice on how to fix malware problems? Of course not -- it would be a silly for a phone app to turn into an anti-virus program. You have Skype running, waiting for a call. Sure enough, up pops a notification window from an unknown caller, displaying this title: *** Call from SYSTEM NOTICE - URGENT ONLINE REPAIR ***. I've been getting 2 or 3 of these calls every day for the past week, and they are very annoying. "This is an automated computer systems alert for [insert date]. Your system's speed and performance is below average. Your computer protection service is not active. Immediately go to www.SS###.com to reactivate computer protection and perform full system diagnostic and repair." I obscured the site name in the preceding paragraph. You don't want to go there! Visitors to this website are treated to a phony "malware scan" while malicious software is sneakily downloaded to their computers in background. 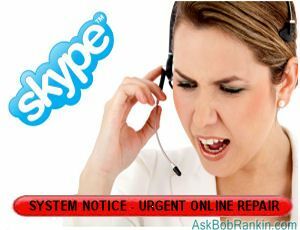 Let me clear up some confusion about this Skype "urgent online repair" scam. This message and the related scam is not from Skype, or its corporate parent Microsoft. Just receiving the scam call does not mean that your computer is infected. And further, you cannot harm your computer just by answering the phone call. You'd have to manually key in the website that the scammers mention in their message, before any damage is done. If you did get one of these calls, and you went to the scammer's website, don't panic. Most likely, your anti-virus software protected you from any drive-by attack or malicious downloads. But just to be sure, I suggest a scan with the Free MalwareBytes AntiMalware tool or one of these Free Anti-Virus Programs. There are several ways to deal with these Skype phishing calls. Ignore and don't answer them. It takes only one click to hang up on the scammers. If you do answer, don't follow any instructions you may hear. Block and report the scammer to Skype. Right-click on the caller's Skype ID in the "recent calls" section of the Skype app. Select Block This Person. In the window that appears, click the "report abuse" checkbox before confirming the block. Blocking, however, is only a temporary solution, because the scammers keep creating new Skype accounts and calling again. It baffles me why Skype has not proactively banned all Skype accounts with the words "SYSTEM NOTICE", "URGENT ONLINE REPAIR", and other variations in the profile name. This seems like an easy thing to do, and given the scale of this scam, they should have done it yesterday. Hello, Mr. Skype? Can you fix this, please? Here's what I suggest: You can change your Skype privacy settings to prevent future calls from scammers and other unknown parties. Click on Tools Options >> Privacy >> Privacy Settings. Then under Allow Calls From and Allow IMs From, select People in My Contact List Only. Obviously, this not an option for businesses that use Skype to receive inquiries from potential customers, but it will work for most users. Most recent comments on "Warning: Skype Urgent Online Repair Scam"
I received a scam text message, 2 days ago, which looked "phishy" enough for me to google it. This blogspot lists the same message: http://polarverse.blogspot.ca/2012/06/smstest-message-scams-walmart-winner-of.html. I traced the number down to New York. I also called my phone carrier, and wasn't surprised to find out that they couldn't do much. The only option is to send "stop" . . . (Do Phishers and Scammers smile, when they get such a message? ;-) Are there other remedies? EDITOR'S NOTE: Not much you can do about SMS spam, except delete and block. I've used 800notes.com to find out who's calling, and it's usually reliable. ScamBusters is run by friends of mine, and is an excellent resource. I received several of these "fishing expetiditions and just ignored them. I use ITOK which guards me system 24/7 and warns if I go to a site that is fishing/scam/virus/ or any infections at all. I highly recommend this service. Have received several during the last week. I bit on the first one, because I expected a notification from a friend. However, I did realize it was bogus and did not access the website. A close call!!! Wouldn't it be nice to be able to write a script which can be autosent to the scam site to fry their system before they could launch their own scumware. I received a similar scam via telephone. First of all REMEMBER MSFT does NOT CALL you or monitors your system. This was the 2nd attempt by the same scammers via Telephone. They tell you that they are from MSFT and your computer is infected blah, blah blah. I then said are you aware that you called the ATTY GEN office? That got a quick disconnect. They use various 800 numbers and are not even in the USA. I have received many of these on my iPhone and iPad Skype accounts. The odd part is they are auto answering and I cannot find a way to change that. There is NO way to block the caller, no right click option and I haven't found a way to stop auto answering. Guess I have to install on a desktop so I can right click and block for my account? In the meantime, I have had to sign out of Skype to stop the calls. I also notice when it answers, it displaying RECORDING. What is being recorded? Great site I've loved it for a while. I saw this thread a while back, please forgive me the post in an area inactive for a few months. I just think the thought belongs here. Being I had this problem myself I was very interested. The solution turns out to be nothing like posts anywhere allude to. People were getting calls from named ids not phone numbers like System.Repair or many others if they answered it were told their computer was infected and to go to a website..... Turns out it's not a very complex phishing scheme. So sometime in near history Skype converted everyones callerid and defaulted it to a Euro number +6617480240 or this default setting is the result of us setting some parameter in the skype gui. I discovered this when a friend said "what is this number you are calling from". He then did a search on the number which raised our suspicions further. Updating your number in callerid at skype.com is free and should clear this mess up. So far I am spam free. Why do some get it and not others? I really don't know, it could be where you fit in the proprietary network ie supernodes etc. Thanks for this - my wife uses Skype and got this scam today, I never use Skype and was clueless to how this happens - I'm going to have her changes the settings.